↑ Генрих Гейне. Собрание сочинений в десяти томах. М.; Государственное издательство художественной литературы, 1958. Том V, стр. 188-191. Liberty Leading the People, Accidental Icon? (26 min), Canal Educatif. Eugène Delacroix (1798–1863): Paintings, Drawings, and Prints from North American Collections. Full text exhibition catalog from The Metropolitan Museum of Art, which discusses the painting. 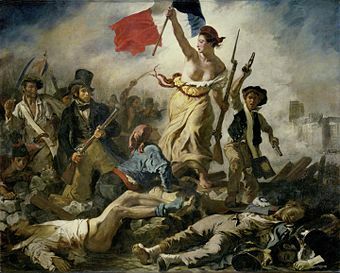 Romanticism in France Delacroix's Liberty Leading the People From smarthistory. ArtSleuth: Liberty Leading the People, accidental icon ? Video analysis.